Today the Confetti Park Players had an awesome time shooting a video for a feature song of our upcoming CD, We’re Going to Confetti Park. The song, called “Watch Out for the Pirates,” was written by Greg Schatz and Katy Ray. What better way to illustrate the song than with NEW ORLEANS PIRATES? This weekend was the kickoff for NOLA Pyrate Week, a festival celebrating the pirate heritage and culture of South Louisiana. Too Perfect! 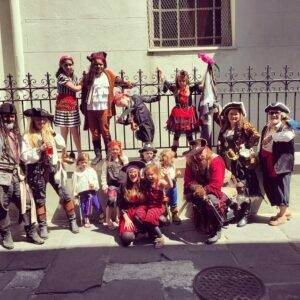 We owe a huge thank you to the wonderful pirates, Captain John Swallow and QM Seika Hellbound and their NOLA Pyrates crew for telling our kids stories, teaching us how to swashbuckle, and sharing with us important pirate history and lore. The hosts of the shoot were the wonderful owners and staff at Pirates Alley Cafe at 622 Pirates Alley behind St. Louis Cathedral. Thais, the kids loved their treasure! The kids will be dressed as pirates again for our French Quarter Fest appearance, in the Kids Tent on Sunday, April 12 at 11 a.m.
And another thank you to our sweet videographer, filmmaker Ava Santana-Cassano. Watch out for the Pirates!! !